I reviewed the last issues of all three titles of these together last time, and since they all came out within a couple of weeks this time around, I just figured I'd do it again. So, here goes. 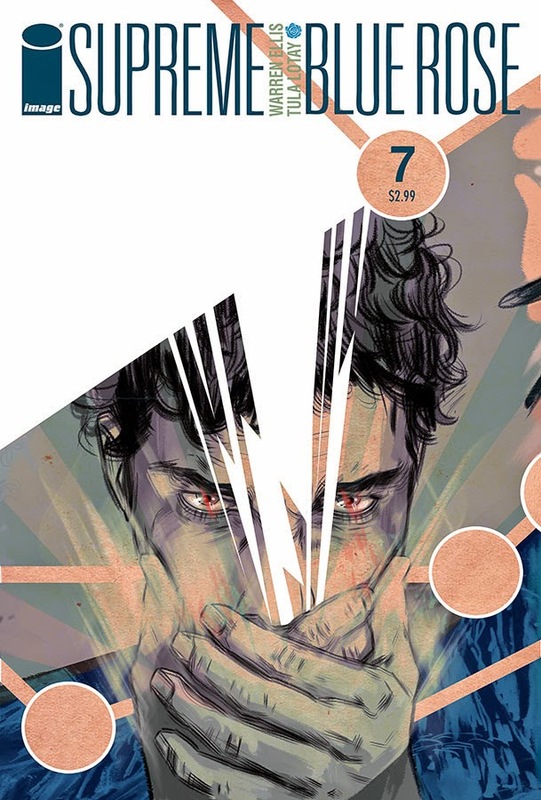 Supreme: Blue Rose #7 by Warren Ellis and Tula Lotay concludes what has been my favorite non-Big Two series in a while satisfactorily enough, and if anything, I felt that it could have actually gone even longer. The pieces all fell into place rather neatly, and if you were a fan of Alan Moore's Supreme run, I think you'd really enjoy putting the puzzle together and seeing how everything fit. Our protagonist, Diana Dane, finally runs into the object of her search, Ethan Crane, and gets to the bottom of everything. Everyone converges on this one moment, and each moment within this one moment is beautifully executed. Evening Primrose's last line of dialogue, for me, especially with Tula Lotay's art conveying her sorrow and pain. If I have any one complaint at all about the entire series, it's that the ending is jarring enough so that it feels like once the mysteries are solved, the story is over. As a result, it makes it feel as if the mysteries were more important than the characters, and, well, the characters grow on you as the series goes on. It makes it seem that the characters didn't matter so much in the end, although the ending would show that the point is that the characters and their story engines will always endure. Unfortunately, it feels at the end that the message matters more than the messengers, and that's a bit of a shame. 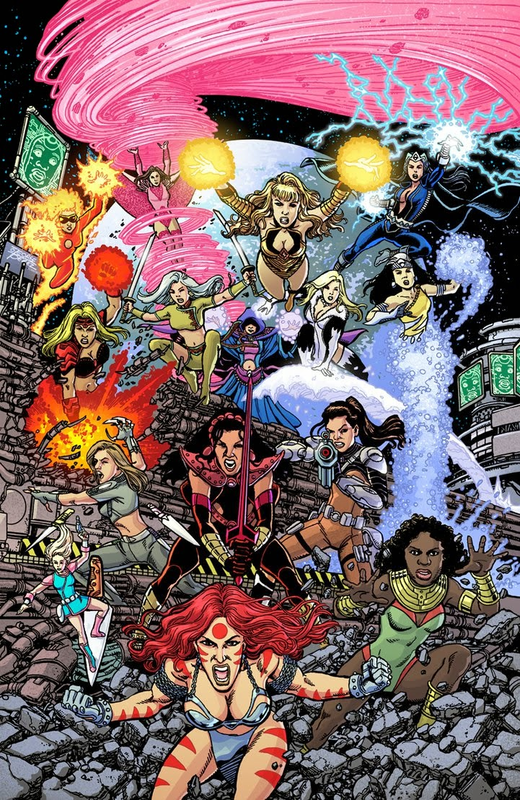 Sirens #3 by George Perez starts off with backwards step-by-step progression of the creation of a comic, with each succeeding page going without colors, without inks, and then without art, as it is revealed that everything the Sirens are going through has been written and drawn as far back as the mid-80s. It's an intriguing, if not particularly original, development, made more so by a just-as-intriguing cliffhanger. The story's still too ambitious — some scene transitions are jarring, and there were a couple of times I had to figure out if one character was really another, but it feels a bit more controlled than the previous two issues, so I think Perez the writer has been getting a better handle on the story. Perez the artist — well, I chalk it up to eye surgery, and as heartbreaking as it's been seeing Perez's decline, it would be more heartbreaking to see him stop drawing altogether. 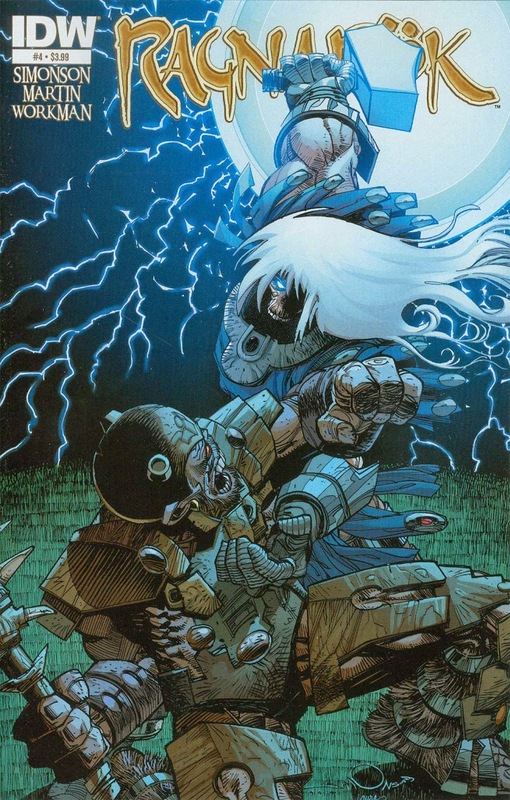 Ragnarok #4 by Walter Simonson and Laura Martin is just amazing. Look at those covers! Which one would you get? I got the second one, but I go back and forth. It's just such a dynamic comic. And I'm just at the cover! Thor fights a troll in this issue and while it could easily be just a knockdown dragout fight (and it still is), the troll is given more depth than you'd expect just looking at him. 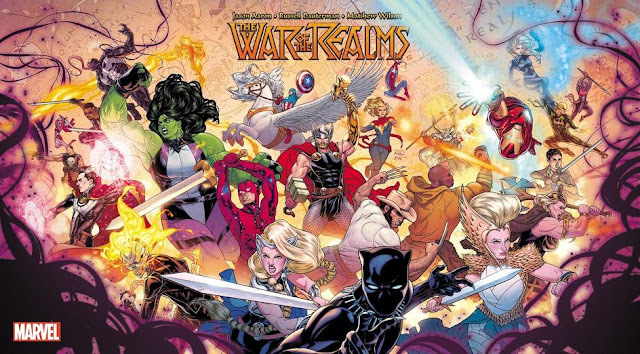 The whole issue sets out Thor's capabilities, showing everything he can do, while simultaneously laying out the kind of person he is: hot-tempered, eager to fight, but also intelligent and caring, someone who would teach people how to fight instead of just letting them die. It's an incredibly nuanced comic in an incredibly dynamic package. Also, I just found this panel fascinating. "For some reason, I had difficulty imagining how I wanted to ink the second panel, to imply heavy rain and keep the fairly simple shapes of the houses visible. I put it off for a day or two, annoyed with myself because I know that Bill Sienkiewicz would have solved this in about 20 seconds. But the rest of us just have to do the best we can. Finally just jumped into it, and I thought it worked out pretty well in the end." It's interesting to see such a skilled veteran like Unca Walt still being challenged by these things. 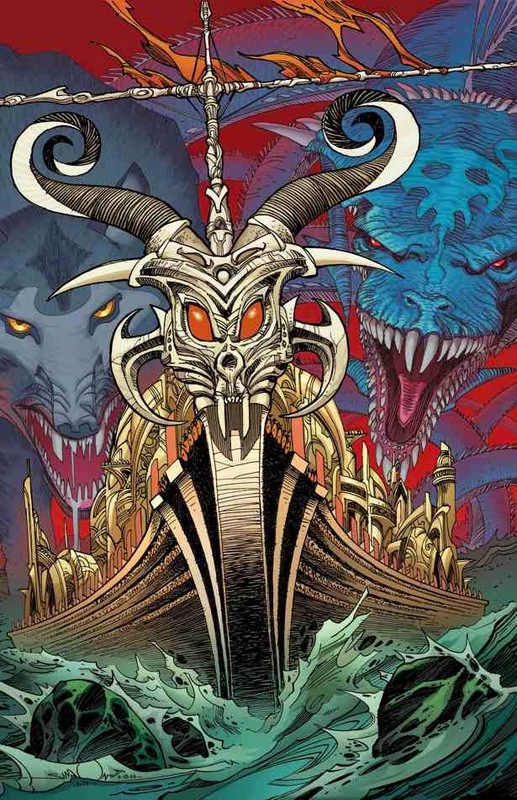 That's another thing I enjoy about Ragnarok — seeing Walt's process doesn't spoil anything, and the black and white art is educational, although of course, Laura Martin's colors give an already dynamic book even more energy. These are not the best or most balanced reviews. I liked these comics. Go buy them. Support people I like. You'll enjoy them.